Propane is a safe, easy-to-use fuel source for home, recreational and commercial needs. Over 90% of the world’s propane is made in the U.S.A. and more and more Americans are finding propane to be an excellent source of fuel for their lifestyles. Propane can be used for heating, autogas, gas grills, powering fork lifts, crop drying, generators and so much more. To get technical, propane is an odorless, colorless by-product of natural gas processing and petroleum refining. At atmospheric pressure, propane is a highly-flammable gas, but it can be liquefied under a moderate increase in pressure. Both the liquid and gaseous forms hold great potential and versatility as fuel sources. Because propane is odorless, it can be hard to detect leaks. That’s why the odorant ethyl mercaptan is added to propane – this is what can be smelled in the event of a leak. How Do I Read My Propane Gauge? All Van Dyke Gas tanks have a gauge located on the tank to estimate how much propane is left in the tank. Most propane tank gauges read from 5% to 80%. To determine how many gallons are in your propane tank, multiply the reading by the capacity of the tank. For example: A 500-gallon tank that read 30% on the gauge has 150 gallons left in the tank approximately. This is a way to estimate how many gallons of propane remain in your tank before you call for a refill. Will Call customers should call Van Dyke Gas before your tank reaches 20% to schedule a delivery. Deliveries may take up to five (5) days. Why Does My Tank Gauge Read 80% When Full? This is a common question that we hear from customers – why does my propane gauge only read 80% when it is full? The 80% fill rule is a preventative safety measure to help combat fluctuations that happen inside a tank. Propane, like water, will expand when heated but it does so at a different rate than water does. Propane’s volume increases almost 17 times greater than water at the same temperature fluctuation. To allow for this expansion to take place in your tank, propane tanks are filled to 80% of their capacity. You can see the changes in your gauge depending on the temperature outside – on a mild day your gauge could read 80% but on a hot summer day, a tank filled with the same amount could register at 85% or higher. A safety inspection is required when a new tank is set to ensure that your propane system is functioning at the correct pressure with no leaks. A safety inspection is also necessary if you run out of gas. When a line is depressurized, a leak may be created. It is required that a safety inspection be done before the system is put back into service. When Does Residential Pre-Buy Become Available? June – August of each year. What Changes With Propane Pricing? When it comes to the cost of propane, typically there has been a steady increase over the last several decades with an ebb and flow in seasonal pricing. With some factors outside of our control when it comes to increased demand for gas and propane, Van Dyke Gas makes every effort to save our customers money by helping avoid volatile spikes in propane costs. Van Dyke Gas always positions our supply to keep consumer costs as low as possible and provide consistent service to our customers. Van Dyke Gas works hard to apply effective procurement strategies to assure customers a constant supply of fuel and propane throughout the year. Where Can I Find Information About Tax Credits and Rebates? You can also learn more about the tax credits, rebates and savings, visit the Energy.gov website. What Do I Do With An Expired Propane Tank? By law, after 12 years propane cylinders need to be inspected to ensure they are fit for service. 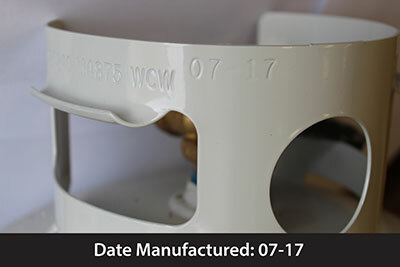 Once an inspection has been completed and documented, the cylinder will be stamped with a new date, allowing it to be filled for another five (5) years. Van Dyke Gas is a licensed propane tank recertifying agent and can have this process completed while you wait, without any appointment necessary. How Do You Dispose Of A Propane Cylinder That Is No Longer Needed? Propane cylinders that are no longer needed or fit for service need to be disposed of properly. Most recycling companies will not accept hazardous material containers. For a minimal fee, Van Dyke Gas will dispose of your cylinder properly and safely. We do not accept one (1) lb throwaway cylinders. It is best to consult the container manufacturer for the proper steps in disposing of these cylinders. If you have any questions, feel free to contact us. Van Dyke Gas has provided reliable residential home heating and commercial cylinder delivery to southeastern Michigan for over 50 years.